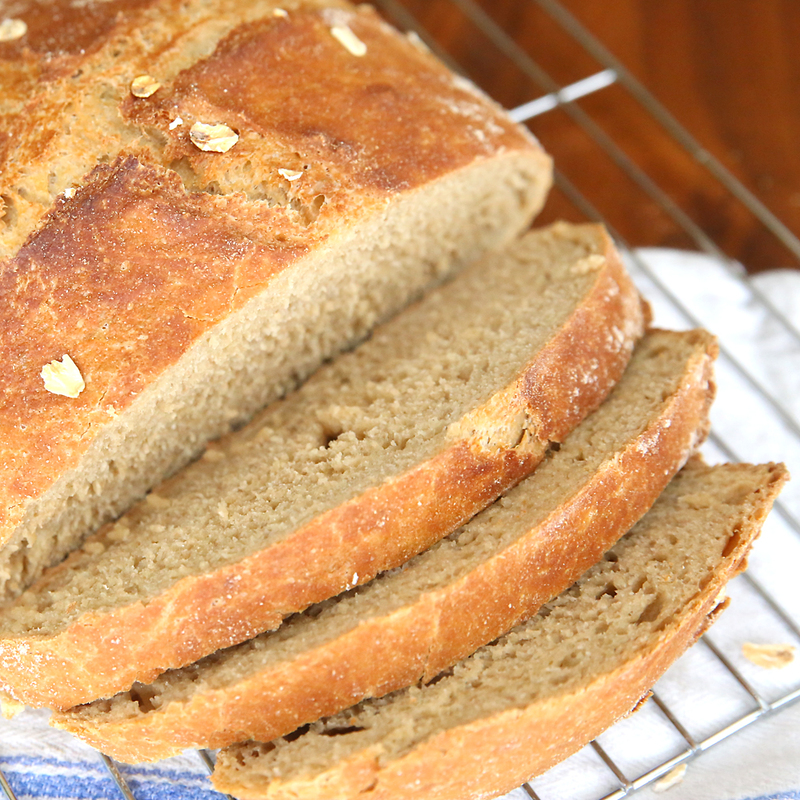 Far and away the most popular post on my blog has been this easy 4 ingredient artisan bread recipe. 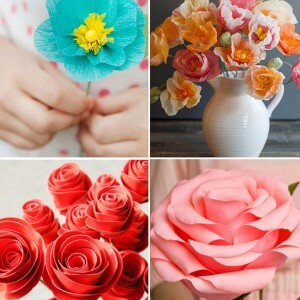 It’s so fast and simple and turns out so beautifully that people just love it (myself included). 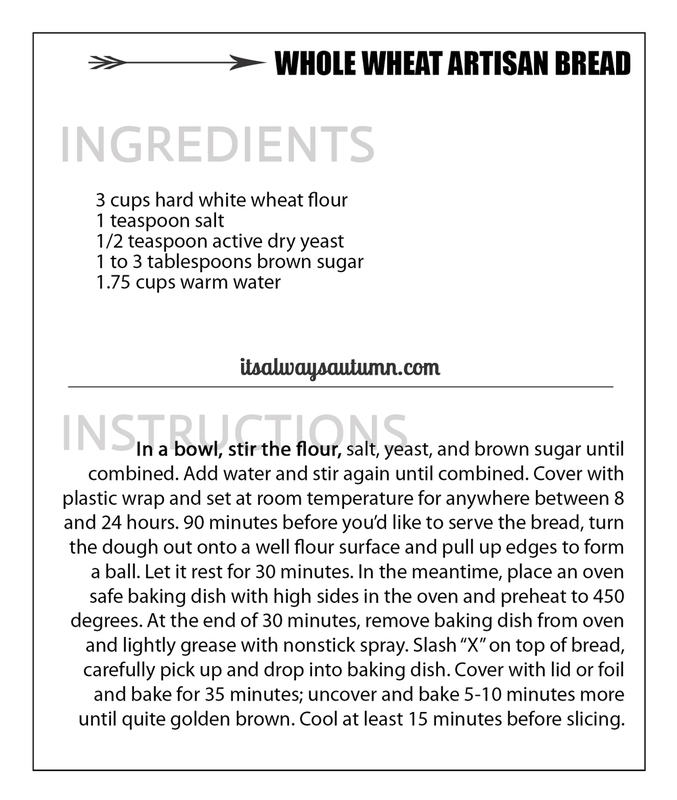 But one question I’ve gotten asked over and over and over is this: can you make artisan bread using whole wheat flour? My answer, up until now, has been no. Whole wheat flour doesn’t work the same way white flour does, so you can’t simply swap out white for wheat and expect a great result. But since so many people were interested in a 100% whole wheat version, I did some experimenting and came up with a beautiful 5 ingredient 100% whole wheat artisan bread recipe. 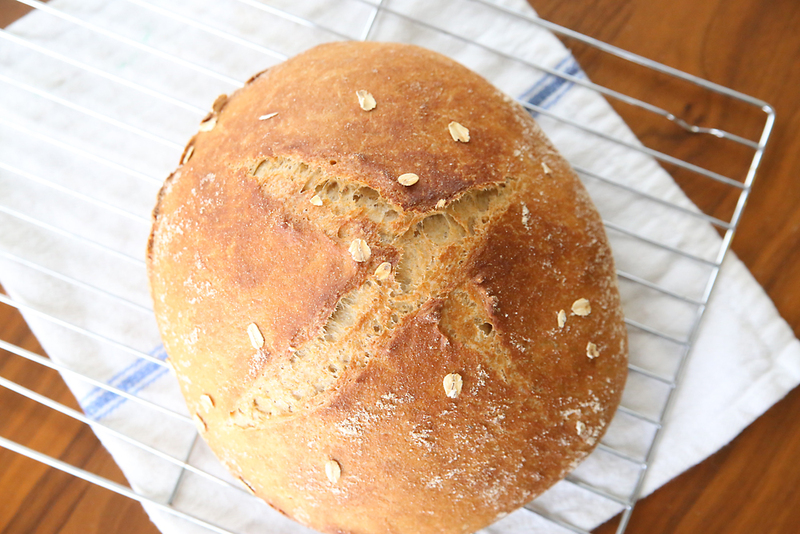 This whole wheat version has a lot of the same great qualities as the white version: it’s a no-knead recipe, which makes it easier than any other bead I’ve ever made (think homemade bread for dummies) and it only takes about 10 minutes of hands on time. The outside is crusty while the inside is chewy, and it’s really quite pretty. And this version is, of course, made with 100% whole wheat flour, which is great for people trying to make the switch away from white flour. Now, in all honesty, can I say the whole wheat version is just as good as the original? No. 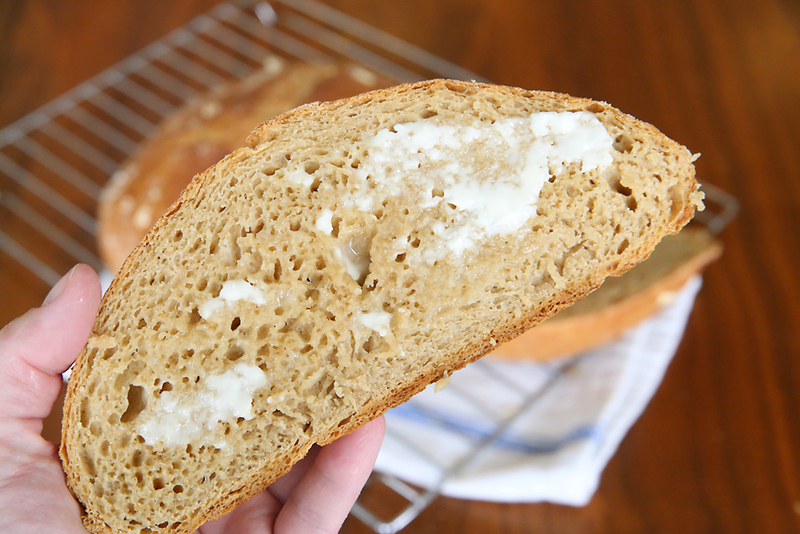 When it comes to homemade bread, I always prefer the taste and texture of white flour. I know that might make me a bad human being (I also prefer ice cream to vegetables, any and every day of the week), but that’s the way it is. The white flour version is just a little tastier and a little lighter than the wheat flour version, IMO. It also rises a bit higher with larger air pockets. However, if whole wheat bread is what you’re looking for, I can honestly say this is a very nice rustic loaf. If you’ve made the original artisan bread before, you’ll see that the method for this whole wheat version is almost exactly the same. The ingredients are very similar too; we just use a bit more water in the wheat version because wheat flour absorbs more water than white flour, and I’ve added some brown sugar as well. 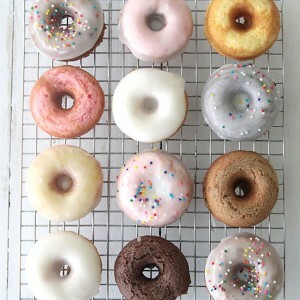 There are two reasons for the addition of sugar: first, wheat bread generally doesn’t rise as high as white bread, so adding in a small amount of sugar helps give the yeast a boost so you don’t end up with a hockey puck. And second, I think the wheat flour really benefits from a bit of sweetness. I used 3 tablespoons sugar for a nice flavor. You could probably get by with less, but don’t leave it out completely – use at least 1 tablespoon for a nice rise. As with the original artisan bread, this recipe uses a very long rise time instead of kneading. That means you’ll start by mixing up the ingredients 12-24 hours before you want to bake the bread. So you do have to plan ahead to make this recipe, but in return it only takes about 5 minutes of work to get it ready to bake. 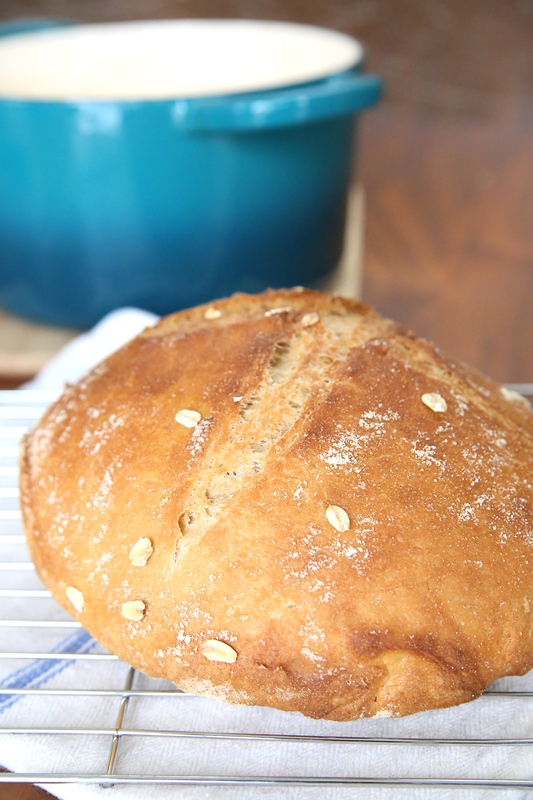 One last note – I used hard white wheat flour for this recipe, and I highly recommend it. Whole wheat flour is milled from either red wheat or hard white wheat. 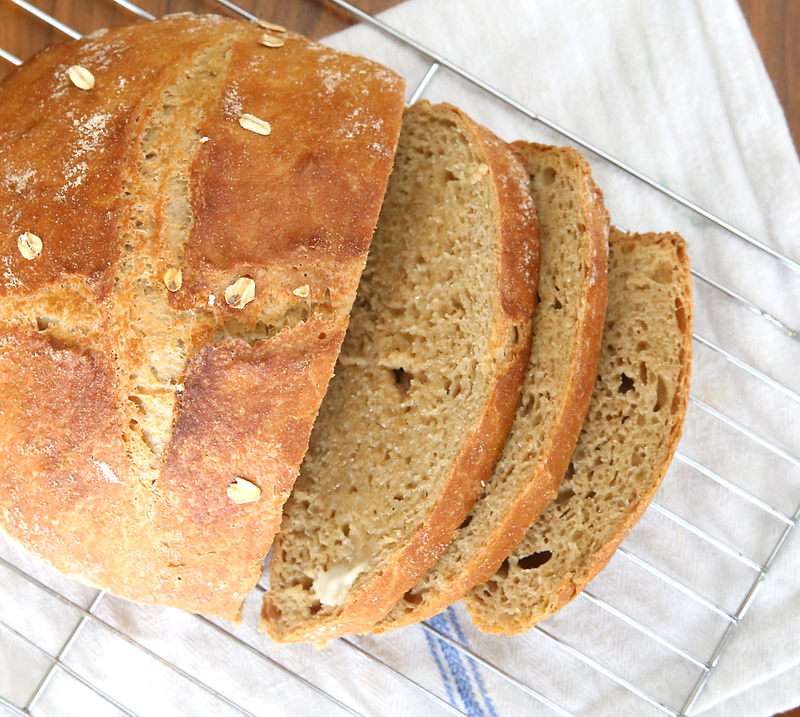 Both kinds are whole wheat, the but hard white wheat flour will give you a softer, lighter loaf. I haven’t tried this recipe with red wheat flour, but I’m guessing it won’t work very well. Also, be sure you use new whole wheat flour for this recipe – you’re not going to have lots of luck with 30 year old food storage wheat in this recipe. Ok, ready for the instructions? First, click here for a printable recipe card. Next, here’s an instructional video I made that walks you through the entire process. Please note that this is for the original (white flour) artisan bread recipe. So some of the measurements will be a little different than what you need for the whole wheat version. However, the process is exactly the same. Let the bread cool for 15 minutes before slicing or you will squish it and you’ll be sad. 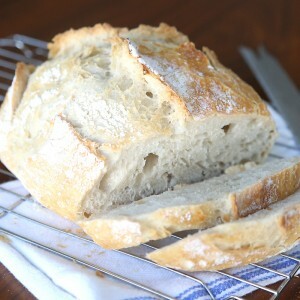 The crust is extremely crunchy when the bread is first out of the oven, but it will soften as the bread cools. We almost always eat the entire loaf immediately, but if you want to store it overnight you can place it in a plastic bag once it’s completely cooled. That will soften the crust even more. To keep a crunchier crust, you can store it in a closed paper bag. If you find the top crust gets too brown, you can bake the bread covered the entire time. 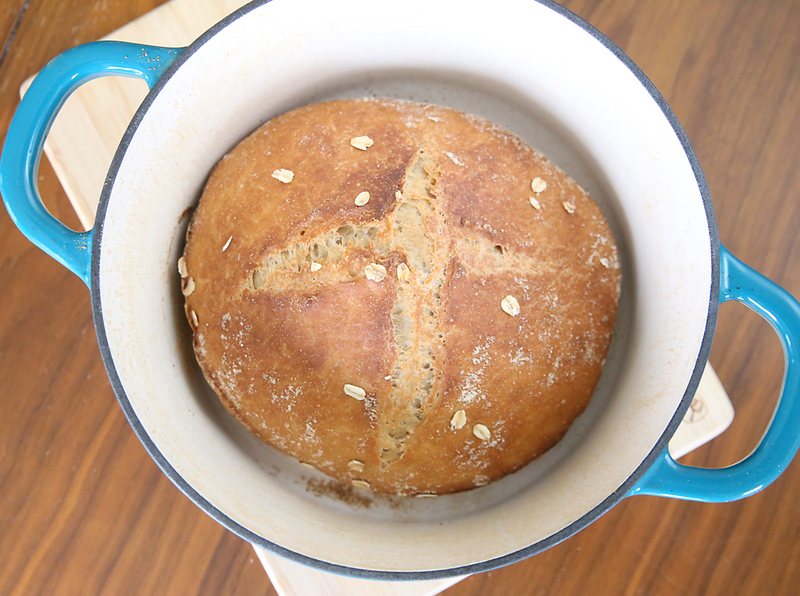 I prefer to bake artisan bread in my new dutch oven (it’s so pretty! ), but I discuss other baking dish options in the original post (as well as quite a few other tips, so reading that post is a good idea if you have questions). I like to drop a few oats on top of this loaf before baking for decoration, but that is completely optional. Looks Delicious,Autumn! I will have give it a try! Ah, thank you! Thank you! I am so excited to try this. 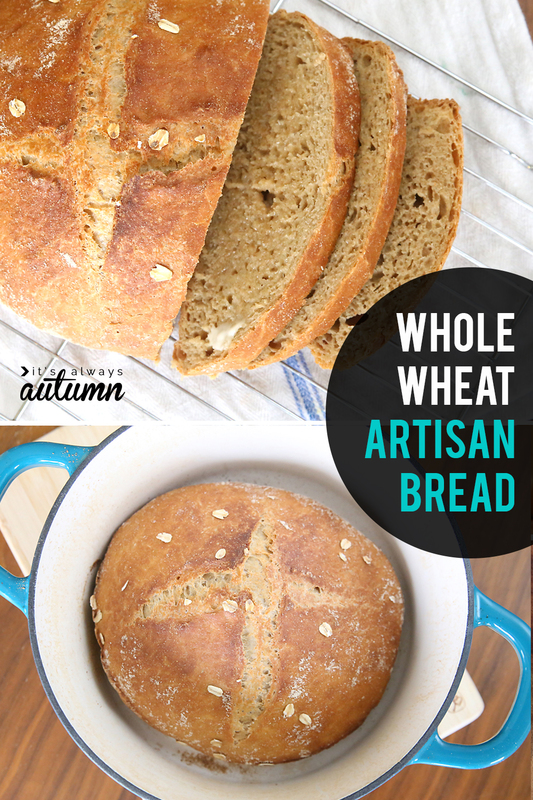 You’re other artisan bread is a family favorite and I’m so glad to get a whole wheat option. I’m doing it today! Would it work to add sunflower seeds and other nuts and grains to the wheat version? Should I add anything else to the recipe along with the nuts & gains? Can you use honey instead of brown sugar? I made this bread last week and WOW! What a wonderful flavor and so very easy. I have a question, however. The bottom crust was very tough – we just had to cut it off – what did I do wrong? I followed the directions exactly. I did bake it in an aluminum “sauce” pan and not a baking pan. Would that have caused the problem? It seemed a perfect size and has a lid. I did slice the bread while it was warm (contrary to instructions) but even the next day although the crust was softer it was still too hard to eat. Thanks for any help you can provide. I want to make this again and again! Tried this recipe after much success with the regular artisan loaf. Is the time accurate? I had to pull the loaf out at 30 minutes because it was smelling burnt and, in fact, the bottom of the bread was blackened. I was able to salvage it by cutting off the entire bottom crust, but am disappointed. Will be cutting it down to the same bake times as the original recipe for the next loaf. Made this with red wheat flour and it turned out just fine. Perfect, even! I did use the 3 tablespoons of brown sugar. Baked in a loaf pan, followed all times in the recipe and has a nice, perfect crust on top and bottom. Currently we are sharing pieces still warm, with some honey drizzled on top! I made this with half Whole what and half white Bread flour. Didn’t need the 1-3/4 c water! Will use less liquid next time. I took a picture but have no way to download it here. What size of Dutch oven? I made this recipe today (started dough last night). It was a bit loose/runny compared to other dough – I’m not sure why, but probably something on my end. Regardless, the loaves came out lovely and taste great! I’m impressed with your website. I was looking for activity day ideas when I found your generous creations. 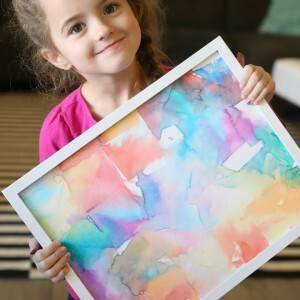 Thank you for freely sharing your creative ideas. I was pleased to see that you are talented in other areas as well. I just printed your artisan bread recipes. Thanks! Your instructions are simple to follow, with a bit of delightful humor. Lovely writing. Basically I like the way you communicate. I need simple.